The Sukhothai era is considered to be very important to the Thais since it is the period in which the Thai ethnicity that we know today was formed. Sukhothai, along with the kingdom of Ayutthaya, constituted the origins of the Kingdom of Siam and its latest version (founded in 1939): the Kingdom of Thailand. Before the founding of Sukhothai in fact, more precisely around 400 A.C., the population that lived in the area were Chinese. What remains today of this great empire, located 12 kilometers from the center of Sukhothai, is its Historic Park, with ruins of the ancient capital of the kingdom within. These monuments were only discovered in the 19th century by the person who would later become the first sovereign of the Kingdom of Thailand: Mongkut. The importance of Sukhothai and its archeological finds are recognized in our times; in fact in 1991 UNESCO declared the Historical Park as a World Heritage Site. Today the town has a population of about 40,000 people, and each year it is the destination of both international and local tourists. 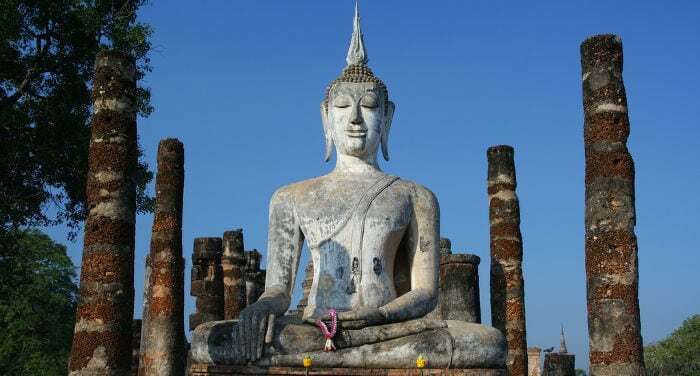 The best time for visiting Sukhothai is during the dry season: from November to March. An interesting event that is celebrated in this period in all Thai cities and beyond (and of which there’s a great one in Laos, in Luang Prabang), is the Loy Krathong. This festival, which is usually held on the days of a full moon each November, is for giving thanks to Buddha for having given water to the Thai people during the year so as to have a good harvest. In Sukhothai, as in Chiang Mai, people gather around lakes and rivers to leave floral compositions in the water, equipped with incense and monetary offerings. Moreover in Sukhothai, the various temples are illuminated with colored lights and there are even fireworks at the temple of Wat Trapang Ngoen. Located about 430 kilometers from Bangkok, Sukhothai can easily be reached by air, train or bus. Air connections to Sukhothai from Don Mueang airport are run by the low cost carrier Air Asia. There are however no direct flights on Air Asia connecting the two cities. The only option is to get a ticket for Phitsanulok (a town located in the central part of Thailand) and from there go by land or bus organized by Air Asia, which will take you to Sukhothai. The same type of air-bus combination is offered by Nok Air. Both airlines charge about 2,000 THB for round trip flights. As an alternative to the low cost carriers, you can buy a ticket on Bangkok Airways. Prices start at 1,490 THB for just one-way, and it will take about an hour and a half (as opposed to Air Asia and Nok Air, where it can take up to 4 hours, since there’s no direct flight). An alternative to going by air is reaching Sukhothai by bus. From the north station of Mo Chit there are many daily connections from 7:00 a.m. to 11:00 p.m. The travel time is between 6 to 8 hours, and on the bus you can take advantage of the air conditioning, internet connection, bathrooms and even a snack and bottle of water included in the price. A ticket costs from 308 to 406 THB a person, depending on the length of the trip, 6 or 8 hours, and whether the bus is considered Express or VIP. To purchase tickets you can go to the station in person or buy them online at 12go.asia. Companies like PGS or Glass Flowers also arrange for private cars or minivans for those who want to travel more peacefully. The cost for renting an entire minivan starts at 5,450 THB, while a car will be 3,450 THB. In this case, the time it will take to get to Sukhothai is only 5 hours. Once you get to the Sukhothai bus station, you’ll have to take a taxi to get to your hotel, since the station is located over two kilometers outside of the city center. The cost of a shared taxi is 50 THB a person. If you’d rather take a train, be aware that there is no direct connection between the capital and Sukhothai. You’d have to take a train for Phitsanulok. There’s a good 8 trains a day that run this route, the first one in the morning leaves at 8:30 a.m. and the last one at 10:00 p.m.
Prices differ according to the type of class, generally they start at 669 THB for a second class ticket with fans and go up to 989 THB for second class night trains with air conditioning. Tickets can be bought at the Hualampong train station ticket office (remember to bring your documentation), or on the web site12go.asia. From Phitsanulok you can then take a bus right to the Sukhothai bus station. The trip takes about an hour and a ticket will cost you a little less than 200 THB. Sukhothai is closer to Chiang Mai than to Bangkok. In fact the two cities are less than 300 kilometers apart. There are no direct flights to Sukhothai, so you’d have to first go to Bangkok and then take another flight. Going by bus (there’s one every hour from 6:00 a.m. to 8:00 p.m.) from Chiang Mai station, you can reach Sukhothai in 5 hours. Tickets cost 373 THB. A private car with the company Jed Yord can get you to Sukhothai in 4 and a half hours, for a price starting at 5,300 THB. With a small and poorly-equipped airport, Sukhothai can’t be reached directly from any destination outside the borders of Thailand. The only option is to take a flight with a stop in Bangkok. Click here to take a look at the best hotels in Sukhothai. The main reason tourists stay in Sukhothai is its historic park, which isn’t located in the middle of town; it’s a little more than 10 kilometers away toward the west of town. The convenience of staying in the middle of town is that each night various markets are arranged, you have the choice of eating in different types of restaurants and you’re close to the bus stop. The inconvenience lies in the distance that separates you from the park, which is easily remedied thanks to the various tuk-tuks and open taxis (the so-called songthaew), which in a quarter of an hour and for 300 THB will bring you right to the entrance. There is the option of taking a bus, but it runs only in the morning for a cost of 60 THB. The price for a guest house in the center is low, you can even find one for 200-300 THB a night. If though you’re not particularly interested in the nightlife, and would rather fully enjoy some relaxation in the Thai countryside, you should then get a hotel closer to the park which is easily reachable by bicycle. A really nice resort a little more than a kilometer from the historic park is the hotel Sriwilai Sukhothai. A double room costs 3,000 THB a night. Another option is the Vieng Tawan Sukhothai, a guest house located even closer to the park entrance. The price for a room is low compared to the Sriwilai: 800 THB. The main attraction is the historic park which opened in 1988 and contains the ancient city of Sukhothai. Once you get to the ticket counter you’ll be asked to pay 100 THB (per zone) for the entrance ticket, and another 150 if you want an audio guide. If you also decide to come with a means of transport such as a scooter, for example, you’ll have to pay a supplement of 50 THB; or only 10 for a bike. The park is divided into 5 zones spread over a surface of over 70 square kilometers. Hours of operation are from 8:30 a.m. to 4:30 p.m., every day. There’s a total of 193 monuments to visit, divided into 3 main zones: north, west, and center (surrounded by walls that form a 2 kilometer square), and two secondary zones: east and south. The center area is considered to be the most important, as it holds a good 21 temples in addition to the ancient royal palace. My recommendation is to rent a bicycle since the park is really big and doing it all on foot would be torture, especially under the burning Thai sun. At the entrance of the park you’ll find the majority of the rest areas and you can easily find bikes for rent for 40 THB a day. Other available options are the tuk-tuks, which charge 300 THB for two hours, and 500 for four hours. In the center square there’s a tram that will bring you to see the main points of interest for just 40 THB. Among the prettiest temples to see in the central zone is certainly Wat Mahathat: the temple that represents the spiritual center of the ancient city. Its name means the Temple of the Great Relic, and this building is actually considered the caretaker of part of the Buddha relics. Its original design was carried out by the first king of the kingdom; yet with the passage of time other sovereigns ordered the modification of some parts of the temple, and for this reason it is possible to admire different architectural styles today, such as the Lanna and Sinhalese. Wat Mahathat is surrounded by walls and a moat. Its location also makes it particularly suitable for admiring both the sunrise and sunset. In the northern area you can find Wat Si Chum and Wat Phra Phai Luang. Inside the first temple you can find a Buddha statue over 11 meters tall, the Phra Atchana Buddha, of which there’s a very similar reproduction inside the Ancient Siam park in Bangkok. After Wat Mahathat, Wat Phra Phai Luang is the second most important temple in Sukhothai, located outside the walls. It was built before the founding of Sukhothai and was decided on by King Jayavarman VII, head of the Khmer Empire. In fact there’s a strong resemblance between the architectural style of this monument and the Bayon Temple located inside the Angkor park, in Siem Reap, Cambodia, which was also designed by Jayavarman VII. To the west is Wat Saphan Hin and this is the monument most worth seeing. This temple is situated on a small 200 meter high hill and inside there’s a Buddha statue 12 meters tall. Like all other figures of Buddha inside the park, this too represents the Buddha in his post-illumination period, that is after reaching Nirvana. The faces on all the various sculptures are smiling and have a relaxed posture; some are seated, and some represent the Buddha while walking (at Wat Sai Si and Wat Tra Phang temple). In fact, during the Sukhothai period, the divinity is pictured in four different postures: while walking, standing, lying on one side, and seated. If you only plan on staying in Sukhothai for just one day, I recommend that you visit the central area, which is the most appealing and holds the prettiest and most important monuments like Wat Mahathat. If instead you have more time, then you can easily lose yourself among the ruins spread across all five areas, where you’ll often not see anyone for several kilometers. The park is actually a very peaceful place, where the locals go (for free, because Thais don’t pay an entrance fee) to relax for a few hours or play some sports outside. In the eastern part of the park you’ll also find a museum, the Ramkamhaeng National Museum. Inside are ancient artifacts found in the historic park such as ceramic statues, and porcelain objects going back to the Chinese Yuan Dynasty. On the first floor of the museum you can also learn the history of the Thai language, born in 1200 thanks to King Ramkamhaeng. In the center of new Sukhothai there’s very little to see other than the shops in the center and a few local markets.